*Bare* Carbon Steel? Aluminized? or what? I've fiddled around a bit with baking, but am just now starting to try my hand at sandwich loaves. In looking for information about various material options, I have seen several suggestions that dark steel pans are a good way to go. I assume we're talking about bare uncoated carbon steel that has to be kept seasoned, but they seem to be pretty hard to find. When I do find them, they are Pullman pans, which (I think) is not what I'm looking for. Am I looking for a unicorn, or am I just searching wrong? Should I be looking for aluminized, even though that's shiny? Tinned? I don't think I am, but am I misreading references to nonstick steel pans? I suppose what I'll most likely end up doing is just starting with the hodge podge collection of loaf pans we already have and figuring out which I like best. Eventually though, I'm going to want to unify, and I'd like to have considered all the good options by then. i think this is one of those personal preference things. if you don't mind seasoning, you could always get a lodge cast iron loaf pan. i bet it's awesome. aside from staying away from the silicone pans. I find that the bread doesn’t brown nicely. Hubby bought them for me thinking he was doing a good thing but I really don’t like them. A little oil and lecithin or baking spray (with same ingredients), a dusting of wheat bran, oatmeal or corn meal and this pan is ready. I like the shape for a wide pan sandwich loaf . There's no reason for bare carbon steel. People love the USA Pan products, which are aluminized steel and have a non-stick coating. The Williams-Sonoma Gold Touch pans are also good. If pans are too dark, the exterior crust can get too brown and thick. Somewhere between shiny and dark seems to work best. Dough will always stick to that which you do not want it to while in the oven and at the worst possible time. I think this is the 37th law of baking or thereabouts. I've found through hit or miss that cooked PAM builds up a wonderful non-stick surface. I used to wash it off the pans, now I don't. A little upkeep is required every 6 months or so, just spray a bit of PAM on and wipe it around with a paper towel. Sounds like I should probably just stick with what I've got and fill out from what of those I like best. 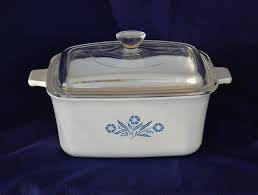 And I think I have that Corningware pan, just never thought of using it for bread. I'll have to give it a try too!